Red, white and green Christmas pin badge. 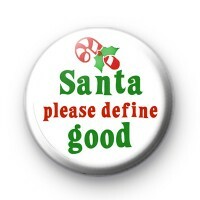 This cheeky festive themed badge has the text Santa Please Define Good written is a bold font with a red and white candy cane illustration at the top. It is a fun holiday badge and would be lovely to give out at your Christmas party or attach to a gift tag or greetings card. Our handmade Xmas badges also make fab stocking fillers. All our badges are 1-inch in size & make in Cornwall with love.